Allseating's Chiroform 24 hour big and tall executive office chairs were built to last the test of time with both an intensive use 24 hour rating and a 500 lb. weight capacity. Chiroform is ideal for task-intensive environments with its fully contoured double-curve backrest that offers superb lumbar support. Other features of the Chiroform big and tall chair include a 6 ply Canadian maple contoured seat pan, waterfall seat edge, high density energy absorbing seat cushion, high density molded foam back cushion (you can also choose the optional energy absorbing back cushion), reinforced construction suitable for up to 500 lbs., pneumatic seat height adjustment, tilt with infinite position tilt lock, adjustable tilt tension control, forward seat angle adjustment, back height and back angle adjustments, 360-degree swivel, height adjustable loop arms and a heavy duty five star nylon base with dual wheel carpet casters standard. Optional hard floor casters available for a minimal charge. 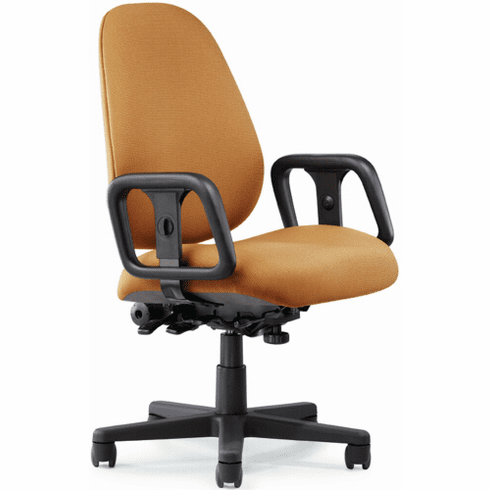 The Chiroform big and tall heavy duty computer chair meets or exceeds ANSI/BIFMA standards. Dimensions: Back Size: 22" - 27"H x 21.5"W. Seat Size: 24"W x 20"D. Seat Height Adjustment: 19.5" - 24.5"H. Overall: 41.5" - 51.5"H x 29"W x 29"D. 10 year warranty from Allseating. Normally ships in 10-12 business days from Toronto CA. *Fabric shown in picture is no longer available. Please click on the color chart links listed below to view available in stock fabric/vinyl upholstery options.